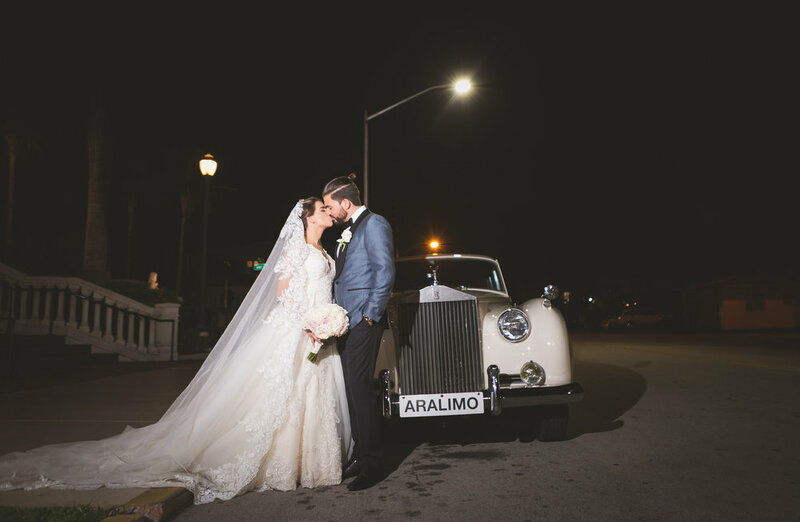 Andrea & Ector are married at the Kimpton EPIC Hotel in downtown Miami! Andrea and Ector played by the motto ‘go big or go home’ when it came to their wedding day planning. 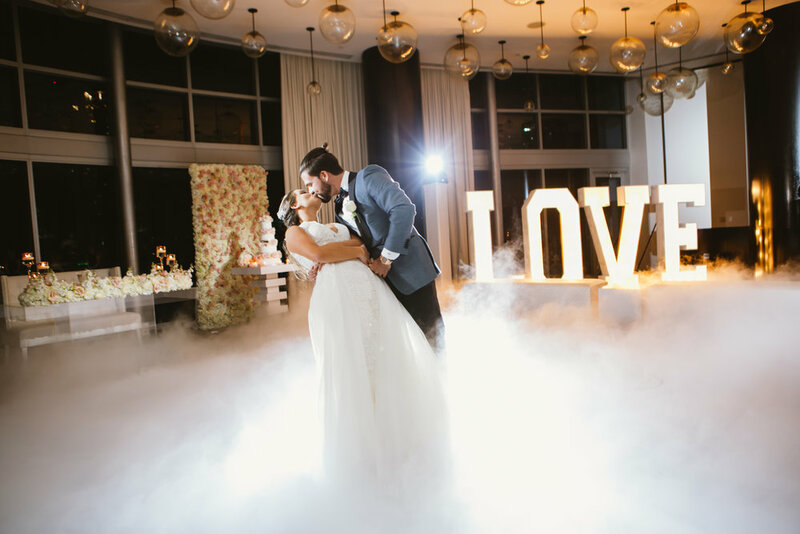 They had an oversized ‘Love’ marquee on the dance floor of their wedding reception at the Kimpton EPIC Hotel and La Hora Loca came in to entertain and delight their guests. All of this happened on a seamless white dance floor that was monogrammed with their initials and the date of their wedding. Wait until you see it below! Their dance floor was also home to their four-tiered wedding cake which was positioned just in front of a gorgeous white flower wall! Andrea was every bit the princess bride on her wedding day and she wore a cathedral length mantilla veil with her lacy white gown. 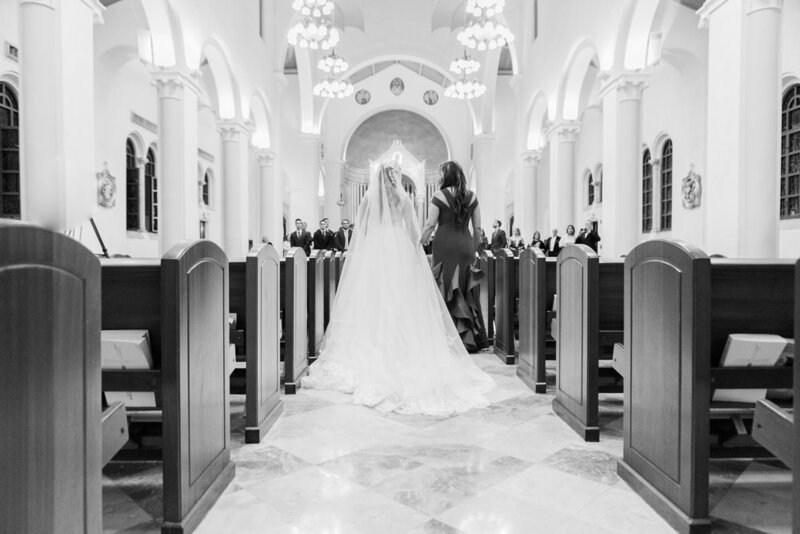 This veil looked like a floating dream as she walked down the aisle of her church to meet her husband to be. Let’s talk about wedding day photos for a moment because the views from the glass balcony at the Kimpton EPIC hotel certainly live up to it’s name! With a high rise view of downtown Miami’s skyscraper architecture, this glass balcony with gray tiles was the perfect spot for my bride and groom to get in some EPIC wedding day photos! Keep scrolling to see more of Andrea & Ector’s wedding at the Kimpton EPIC Hotel in downtown Miami!